This step-by-step approach to learning to play the autoharp will help beginners and teachers understand the many ways in which this versatile instrument can be used. You will learn a variety of strumming techniques and how to work the chord bars, use the different areas of the strings effectively, and play songs and simple melodies. Also included is a brief history of how the autoharp began and developed. 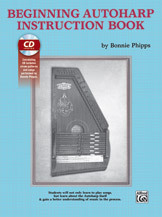 To help you learn faster and easier, Bonnie Phipps has recorded a correlating CD that includes strum patterns and songs in the book.